The deed is done. Just a few hours on Saturday morning and about $10 in 2x2s later, things are looking a little more finished above the stove. Ez crafted a basic frame using the 2x2s and then tacked individual planks of (free) reclaimed wood to create this very rustic and very interesting box to cover the ugliness of the insulated vent pipe above the range hood. It still needs perhaps a coat of stain to bring out the richness and some poly to seal it up, but I couldn't resist sharing these photos with you! Obviously we need to replace the trim pieces near the ceiling and wash a lot of pots and pans (which usually hang from those handy black hooks on the left-hand wall), but it's coming along. I think this new feature really brings some needed warmth to this side of the room, and if we ever get tired of it down the line it will be easy to uninstall and replace. Win-win. 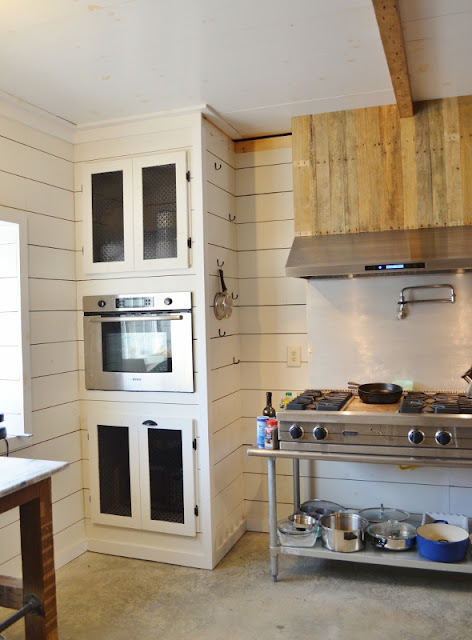 Looking back on past kitchen posts I realized I never shared the 99% finished wall oven cabinet with you, so here you go. The remaining 1% of the work is simply drilling the holes and hanging the last three door handles. There have been bigger fish to fry, so I'm sure you can understand the procrastination... At least there's one hanging there so you can see the trajectory. The stainless table under the stove is just a temporary solution. We continually talk/argue about exactly what the final piece is going to look like. In the meantime, this is a semi-functional rigging. 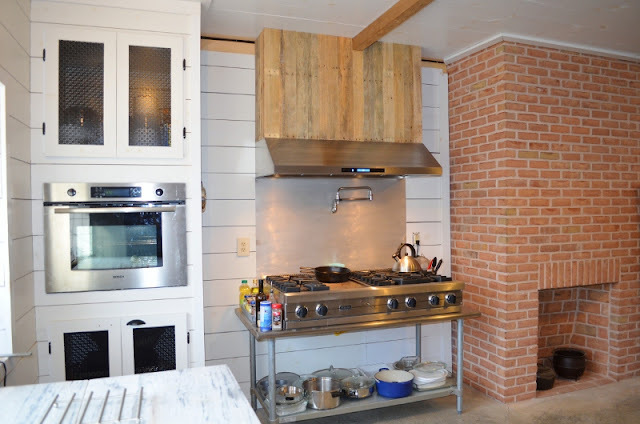 I won't lie -- the constant shifting of pans on the bottom shelf drives me nuts, and the current lack of counter space on each side is frustrating. But we make do. After three years, three months and thirteen days without a functioning stove (and very few restaurants nearby to boot), I've learned not to complain too much about minor kitchen inconveniences. I do, however, look forward to nailing down whatever the final solution will be. So this is the kitchen in its current state. There's still a lot to do, but at least we're getting hot meals and making baby steps forward, which is always encouraging. 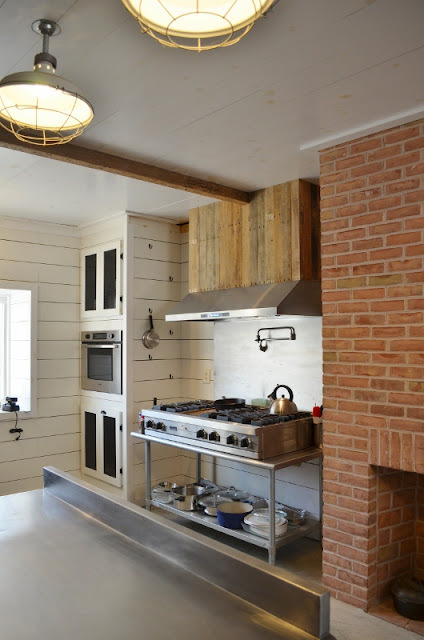 I know there were some out there who weren't sold on the reclaimed wood idea for above the stove. What do you guys think now? Very nice! I'm likein' it. What do you think of a piece of granite on either side of your stove, and cabinetry from wall to wall, faced with more reclaimed wood? You've really got a total look going here. The lights, baker's table, stainless steel, it's all good. We're talking about a wall-to-wall configuration. Ez would prefer a stainless surface rather than stone for easiest maintenance and sanitation. I'd like to do cabinets to match the wall oven cabinet, but he prefers something more open. We're looking for a balance. I guess we'll see what we come up with eventually! It is so warm and beautiful. I do love it. 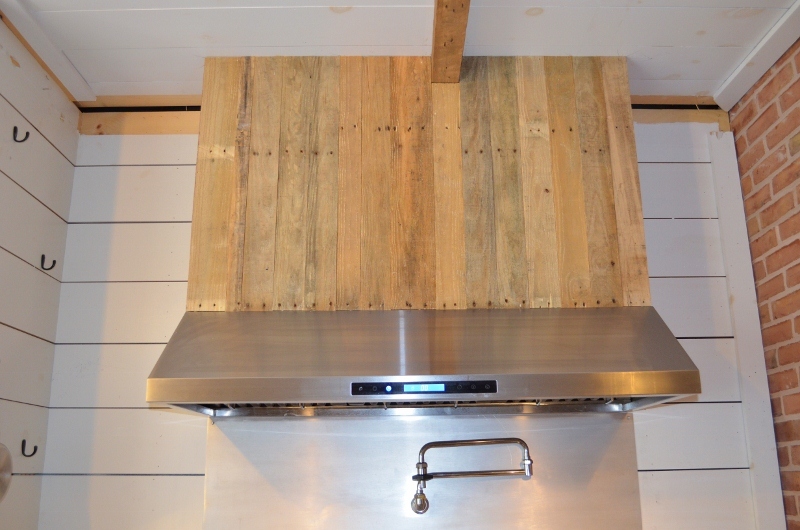 I agreed with you from the start.....the reclaimed wood is the perfect juxtaposition to the stainless range. Love, Love, Love It !!!! oops...... I mispelled my own name. THIS LOOKS SO GOOD. I'm yelling because its awesome. You are seriously the coolest and think out of the box. That's why I love following your blog. So creative. Well thank you! I keep poking my head into the kitchen to look at it. It's kind of rare that something goes perfectly right. Ez gets the credit for making the idea a reality. Yay! It's looking great - it's been so awesome to see this space come together!